When it comes to providing safe play opportunities for both disabled and non-disabled children, not all playgrounds are created equal. You wouldn’t be alone if you thought play areas that are compliant with the Americans with Disabilities Act (ADA) are “good enough,” or if you believed “accessible” playgrounds and “inclusive” playgrounds are the same thing. In fact, the ADA offers no specific definition of what makes a playground “accessible” or “inclusive”. While all playgrounds built or remodeled in the U.S. today must be ADA-compliant, the law generally offers a bare minimum standard that only requires playgrounds to provide wheelchair access. A playground needs to be accessible in order to be welcoming for all kids. However, an accessible playground is not always inclusive for children of all physical and mental abilities. Sound complicated? It isn’t. Read on. However, “accessible” play options aren’t always the same as “accessible” play options in ADA terms. For example, ADA compliance might require an accessible path leading to the playground. It might also require that a large climbing structure has a transfer station where children in wheelchairs can pull themselves onto the structure. Ground-level play equipment might be included in an ADA-compliant playground design as well, to engage kids who are unable to leave their chairs. As mentioned, ADA compliance means accessible routes must connect the play area to the school, parking lot, or facility that it serves. The ADA even specifies the width, slope, and surface of these routes. The law gives a minimum height for “entry points and seats” (where children transfer, sit, or gain access—including swing seats, spring rocker seats, and crawl-tube openings). Taking wheelchair mobility into account, the ADA recommends height, width, and depth minimums for “play tables” where kids gather to play over a shared surface. It also defines “maneuvering space” as the space required for a wheelchair to make a 180-degree turn and at least one maneuvering space be provided on the same level as elevated play components. 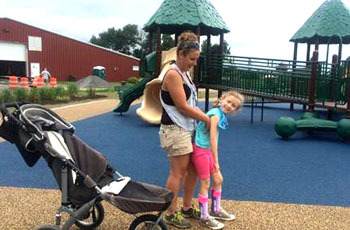 Though “accessibility” is a term often used in reference to ADA compliance, the ADA offers no specific definition of what makes a playground accessible. A nationally-recognized industrial standards organization, the American Society for Testing and Materials (ASTM), developed guidelines in response to the ADA to build on the federally-mandated minimum requirements. 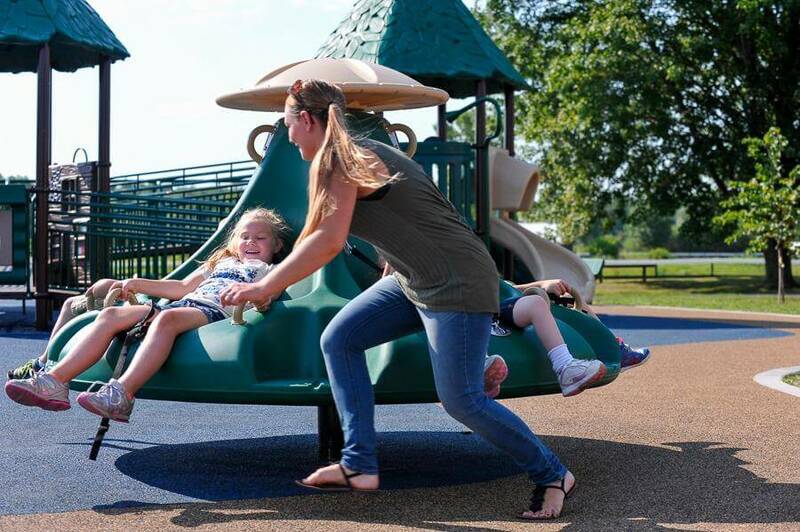 The ASTM F1487 Standard provides guidance on designing playgrounds and play equipment for an even higher level of accessibility and safety. Consider this: Accessibility is about travel, movement, and approach (or entry). So, a playground that is accessible is one that is easy for a child who uses a mobility device to maneuver in or around. 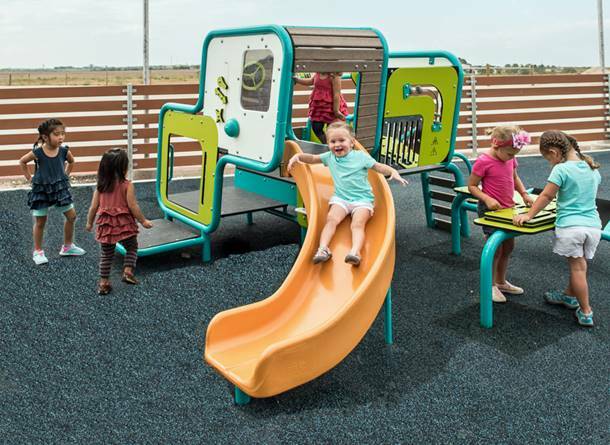 An accessible playground offers a range of play experiences to children of varying abilities. However, it doesn’t mean that every piece of equipment must be usable by every child. For example, a playground that offers a glider for kids in wheelchairs (picture a platform where a chair can be secured) is considered accessible since it provides an alternative to the nearby swing set that isn’t wheelchair-friendly. An inclusive playground is one that encourages and enables disabled and non-disabled children to engage with one another in play and discovery. As mentioned earlier, a wheelchair glider somewhere on the playground makes the playground “accessible.” Modified swing sets where children can swing without leaving their wheelchairs and remain in the same play area as everyone else might make the playground truly inclusive. Inclusion means designing to meet the needs of children who use wheelchairs, have autism or are sight-impaired. There are no “special needs” sections because all the equipment is designed to challenge all children without segregation or stigmatization. Safety surfacing that makes it easy to move wheelchairs and other mobility devices. A slip-resistant, durable material like No Fault Safety Surface keeps children safe from falling and is easy to use with crutches, leg braces, and wheelchairs. Play areas should be designed to challenge children of different ages and abilities. At an inclusive playground, kids can learn to take risks together; none of them are left on the sidelines wishing they could participate. If you’re building or renovating a playground, you should work with an accessible playground equipment manufacturer who understands inclusive design. No Fault Sport Group works with manufacturers to build inclusive playgrounds that emphasize safety, inclusion, and value. Please give us a call toll-free at 1-800-232-7766 and let us know you read this blog.